Calderas are large volcanic depressions formed by collapse of the summit or flanks of a volcano into underlying chambers evacuated by very large explosive eruptions or the effusion of large volumes of lava flows. Earth's calderas range from a kilometer to as much as about 100 kilometers in width; many contain scenic caldera lakes. Calderas may be simple structures formed during an eruption that truncates either the summit of a single stratovolcano or a complex of multiple overlapping volcanoes, such as at Crater Lake in Oregon. Other calderas are compound structures formed incrementally as a result of multiple eruption-related collapses, such as the massive 30 x 100 km wide Toba caldera in Sumatra, which was formed during four powerful explosive eruptions during the Pleistocene. Calderas are most often defined as depressions produced as a result of large-scale eruptions, but the word has also been used as a morphological term that encompasses volcanic depressions formed by erosion or large volcanic landslides. Calderas may be ephemeral features that are partially or totally obscured by post-caldera eruptions. 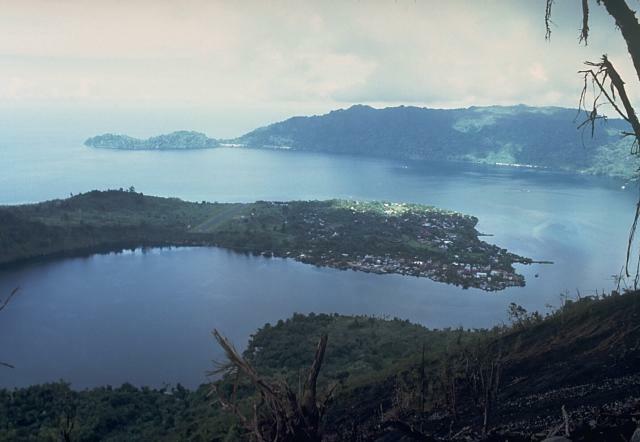 The 35 x 100 km wide Toba caldera, partially filled by waters of Sumatra's Lake Toba, is Earth's largest Quaternary caldera. 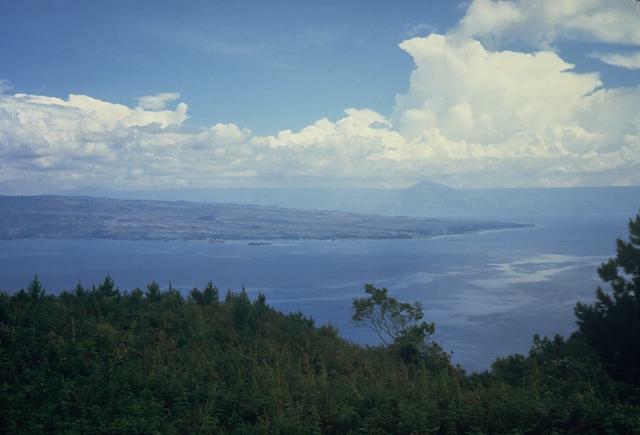 This view looks west toward the northern end of Samosir Island, which is part of a massive inclined block uplifted after eruption of the Young Toba Tuff (YTT) about 74,000 years ago. The island, once entirely covered by Lake Toba, is formed of caldera-fill deposits of YTT capped by lake sediments. The arcuate islands of Neira and Lonthor, seen here looking east from the summit of Indonesia's Banda Api volcano, are remnants of two largely submarine calderas that preceded the construction of the Banda Api stratovolcano. The outer caldera has a diameter of 7 km, the nested inner caldera is 3 km wide. Neira, the largest town in the Banda Islands, occupies the southern tip of Neira Island. Photo courtesy Tom Casadevall, 1988 (U.S. Geological Survey). Mashu is a 6-km-wide caldera on the northernmost Japanese island of Hokkaido. It truncates a stratovolcano constructed on the ESE rim of the larger Kutcharo caldera. Mashu caldera is seen here from its SW rim with the small island of Kamuishi, a mostly submerged lava dome, in the center of the lake. 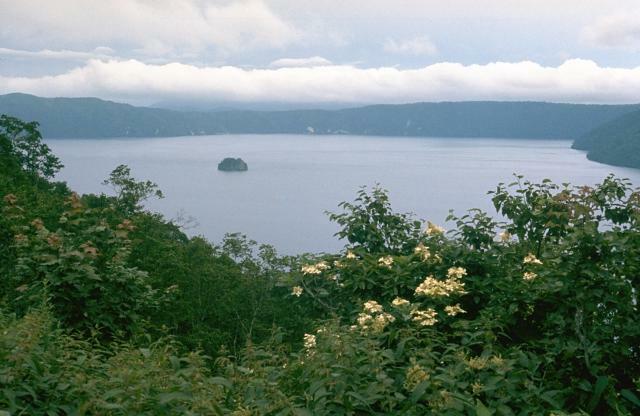 The steep-walled caldera is one of the scenic highlights of Hokkaido. The latest eruption of Mashu took place about 1000 years from Kamuinupuri, whose lower flanks appear at the extreme right. 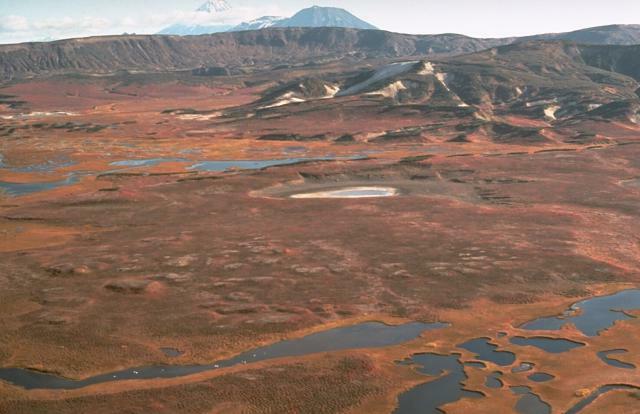 Akademia Nauk caldera in central Kamchatka, seen here from the slopes of Karymsky volcano looking SW, is one of two overlapping calderas formed during the late Pleistocene within the 15-km-wide Polovinka caldera. The snow-capped ridge at the upper left is the southern rim of Odnoboky caldera, whose northern rim is truncated by the Akademia Nauk caldera. 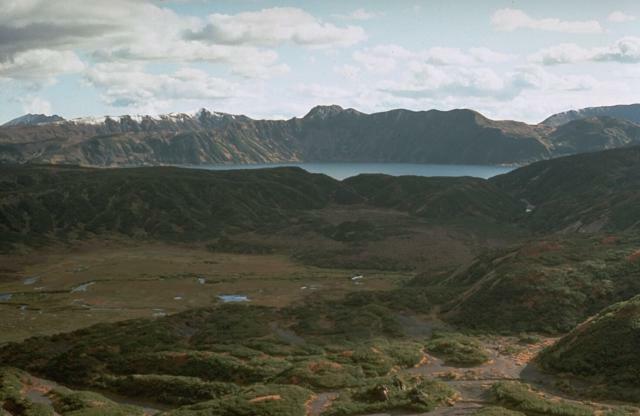 Karymsky Lake fills the 3 x 5 km Akademia Nauk caldera, which had its first historical eruption in 1996. A broad expanse of youthful lava flows extends across the floor of Nicaragua's Masaya caldera, whose wall forms the arcuate rim in the background. 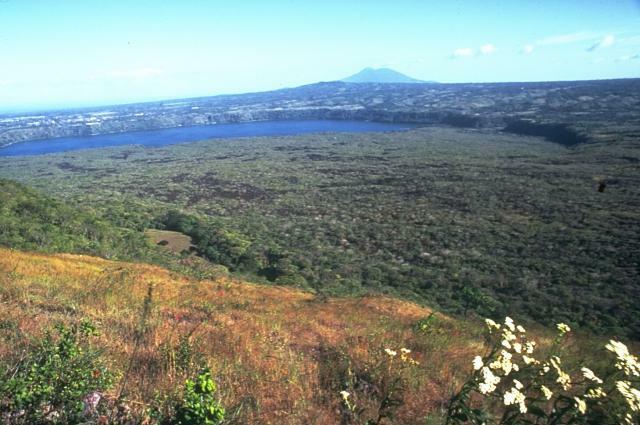 The lava flows originated from the post-caldera cones of Masaya and Nindirí and constrain Lake Masaya against the eastern caldera wall. Recent lava flows have flooded much of the caldera and have overflowed its rim in one location on the NE side. This view from the NW shows Mombacho volcano in the distance. The 7-km-wide, lake-filled Apoyo caldera is seen here from the west with Lake Nicaragua in the distance beyond its low eastern caldera rim. 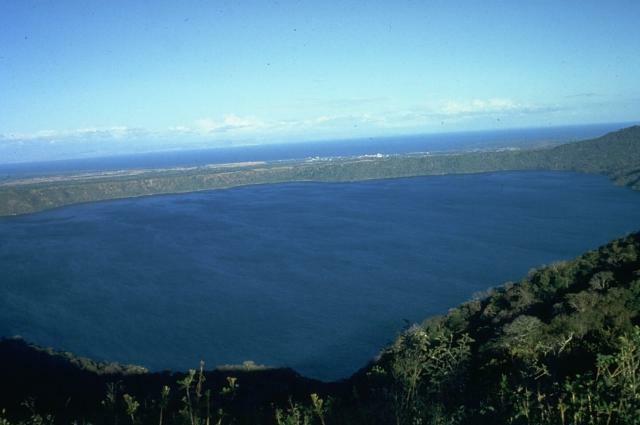 The surface of Laguna de Apoyo lies only 78 m above sea level; the steep caldera walls rise about 100 m to the eastern rim and up to 500 m to the western rim (foreground). 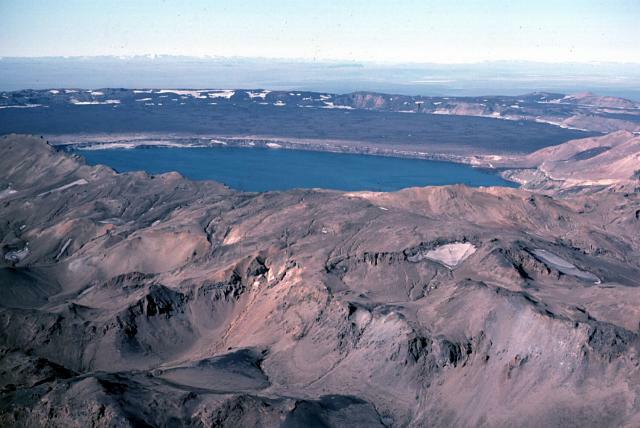 The caldera was formed following two major dacitic explosive eruptions radiocarbon dated at about 23,000 years before present. 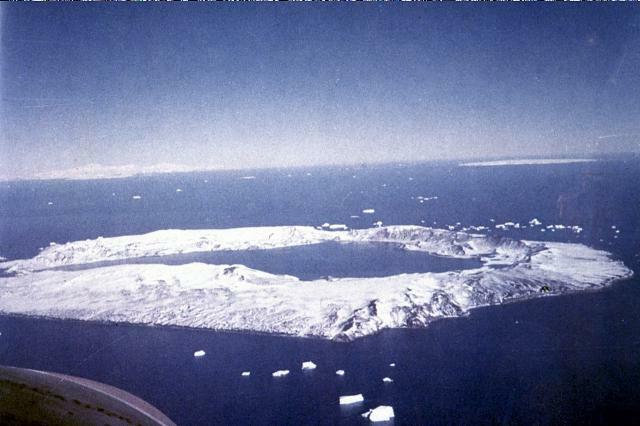 Ring-shaped Deception Island, one of Antarctica's most well-known volcanoes, contains a 7-km-wide caldera flooded by the sea. A narrow passageway named Neptunes Bellows (left) cuts through the caldera wall and provides entrance to a natural harbor that was utilized as an Antarctic whaling station. Numerous vents located along caldera ring fractures circling the low, 14-km-wide island have been active during historical time. Maars produced by magma-water interaction line the shores of 190-m-deep Port Foster, the caldera bay. Photo by Juan Bastias (published in González-Ferrán, 1995).